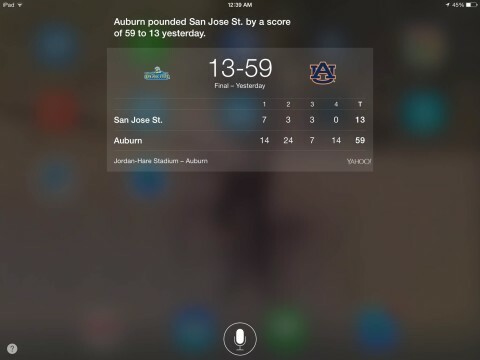 Last week, we learned that when it comes to the dynamics of a football game, the iPhone’s Siri app gives a far more accurate impression than ESPN. So for a real feel for the second week of the college football season, check out what Siri says about Auburn’s 59-13 win over San Jose State, at least when responding to the kind yet firm voice of Kenny Smith. Yep, as far as Siri is concerned, Auburn’s was an Arkansas-game style beat down. Crushed. Soundly defeated. But there’s been a new descriptor added to her gameday vocabulary: Auburn vanquished San Jose State.